When someone is knock-kneed, they may be suffering from internal rotation of the hips. 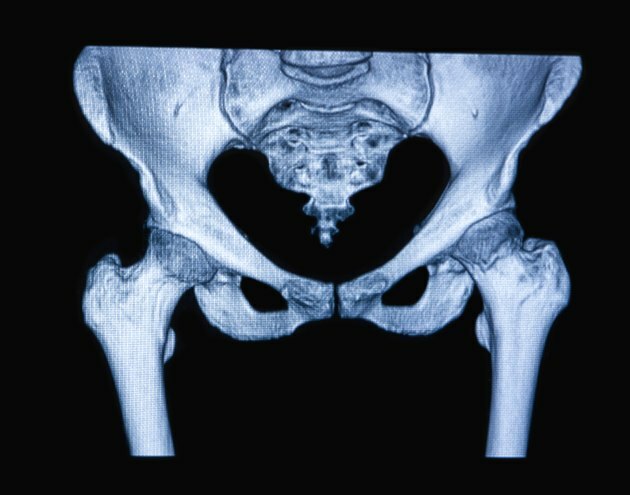 Your hips internally rotate when your thighbones turn inward, turning your knees toward one another. The muscles involved in internal rotation are the tensor fasciae latae, piriformis, and gluteus minimus and medius. It may be possible to correct minor internal rotation through exercises that help strengthen your hips. Consult a doctor before beginning any new exercise program. Also, warm up before getting started. The side lying hip abduction exercise helps to stabilize and bring more motility to your hips. To start, lie on your right side with your legs stacked and feet flexed. Place your right arm under your head for support. Slowly lift your left leg straight up. Try keeping your toes flexed and your thighbone neutral as you lift. Also, work to lift from your hip, keeping your low back stable. Complete 10 to 12 reps and repeat on the other side. Clamshell is an exercise that also helps to strengthen your hips and targets your gluteus medius. To start, lie on your right side with your knees bent and stacked. Place your right arm under your head for support, and your left hand on your hip. Slowly lift your left knee, opening your leg like a clamshell. Complete 10 to 12 reps and repeat on the other side. Once your hips have become stronger, you can add a looped resistance ban on your thighs, just above your knees.